Jon Sarriugarte shows off his "The Golden Mean" at Art Murmur. Once upon a time, Telegraph Avenue and 23rd Street was just an intersection. But after a decade of indie cafes and galleries planting roots, it's more like a nexus of worlds, a cross-stitch "welcome" sign to Oakland's ebulliently independent spirit, a hand-braided weave of ethnic traditionalism and cutting-edge culture — both of which spill into the streets for Art Murmur, the monthly gallery walk and DIY street festival. Meander north for Korean and Ethiopian markets and African-American beauty-supply shops. Stroll south to the formerly splendid, once-again-splendid Uptown district. After-partiers, take note: The neighborhood's cafes and artist-run galleries are within throwing distance of some of Oakland's most beloved music venues: Stork Club, where the black T-shirt set sips $1 PBR and listens to country; The Uptown, saving DJ-party fans and burlesque fans a trip across the bay since 2007; and the daringly deco, decades-dormant Fox Theater, once again pride of the Uptown nightlife corridor. The first Friday of each month, about two dozen galleries and cafes stay open late and a block of 23rd Street fills with revelers for Art Murmur (OaklandArtMurmur.com). Born in 2006 of a desire among gallerists to coordinate opening receptions, the event used to be fueled on merry chaos alone. 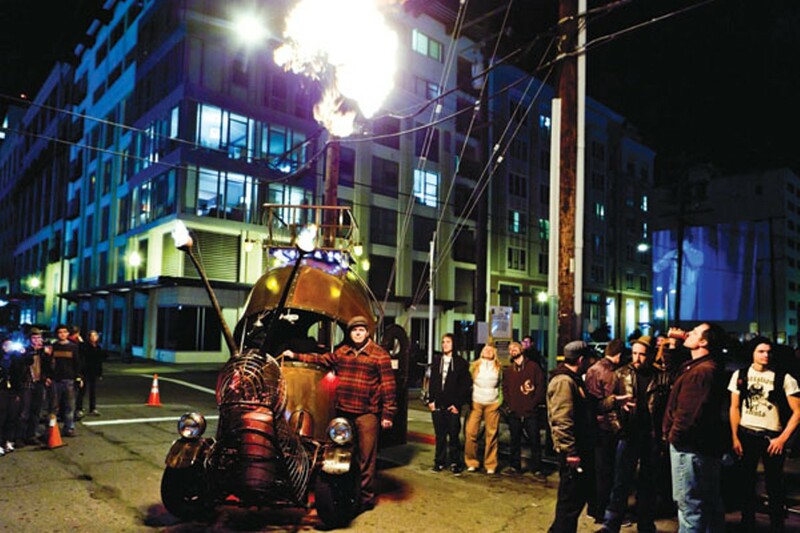 In an attempt to maintain Art Murmur's longevity, organizers are forming a nonprofit and discouraging flame-throwing and public drinking. But Art Murmur hasn't sold its soul, even through a growth spurt that led to crowds of 7,000 last summer. There's still dancing, music (including East Oakland Orchestra! ), and that bike-powered sewing machine guy in the street. Johansson Projects Gallery (2300 Telegraph Ave., 510-444-9140, JohanssonProjects.com) is the gateway to the neighborhood's art spaces — hip enough to draw fashionable grad students and host rocking parties, professional enough to garner national press. Expect fresh, meticulously well-installed artwork that's experimental but not obtuse, intellectually engaging but not impaled on ivory-tower exclusivity, often local but never provincial. The facade is inconspicuous, so look for the old-Hollywood-style spotlight. Whether you get your buzz from good American beers, great tofu salads, organic, chocolate-drizzled doughnuts, or a simple mug of hearty house blend sipped from a vintage, four-seat diner counter, the endearingly scruffy Mama Buzz Cafe (2318 Telegraph Ave., 510-465-4073, MamaBuzzCafe.com) serves it fresh. On a recent weekday, art students, stroller brigaders, and industrious people with laptops lounged harmoniously in the kitsch-dotted back patio and the cafe's sunlit gallery. The cozy, hospitable Lam Toro, (2432 Telegraph Ave., 510-832-1010), dishes up succulent, locally revered Senegalese chicken yassa, grilled fish, and plantains. Make like an Oaklander and follow the three rules of a wonderful evening at Lam Toro: bring cash; when you want "extra spicy," order "medium"; and don't be in a rush. Warmth and graciousness trump time efficiency here. You'll especially want to linger on nights when the African drummers play. Have you heard talk of using "community" as an expressive medium? At Rock Paper Scissors Collective (2278 Telegraph Ave., 510-238-9171, RPSCollective.com), they show us how it's done. The volunteer-staffed organization hosts art classes, craft nights, teen projects, pilates workshops, and the occasional 'Zine Intake Day to stock its 'zine library. RPS's corner storefront gallery is a haven for the handmade, stacked floor-to-ceiling with all things hand-stitched, hand-knitted, hand-printed, and hand-drawn.